A Life Lover’s Guide to Armagnac by Geoff James is a passionate look at the region of Armagnac and the drink named after it. He set out in 2011 to visit the region and experience the culture surrounding the drink for himself and realised that there was very little in the way of Armagnac guide books that cater to English speakers. He decided then that his trip would be the perfect opportunity to completely immerse himself in the history of the region and the production process of the drink, using the knowledge and experience gained to write an English Armagnac guide book to help others who wish to visit the region for themselves. This Armagnac book touches on the history of Armagnac dating back to the thirteenth century and details the process behind the production and distillation of this wonderful brandy. The three main production areas Bas Armagnac, Tenereze & Haut Armagnac each have their own sections in which they are the focus. In these Geoff writes about his experiences visiting the many producers in these areas and makes some recommendations to his readers. A Life Lover’s Guide to Armagnac is a highly informative, fascinating and enjoyable read about Armagnac, its history and how it has gained its reputation as one of the finest brandies in the world. Including many colour photos taken during the author’s time there, resulting in giving the reader an authentic feel for the region. This engaging book will appeal to anybody with an interest in Armagnac, where it is produced and the history behind it. 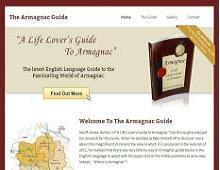 Visit his website to learn more about this Armagnac guide book and buy a copy today!